There is a feeling that creeps up from within that causes me to sometimes feel uneasy and anxious. I often face the direction of the feeling and examine it to determine where the root of this particular cluster of emotions is coming from. It's sort of like when I used to move our Playstation from room to room. I'd have to follow the power cord with my eyes through all the other jumbled cords to figure out where to unplug it from. Anyhoo, I stand and stare at the feeling, and see a cluster of cords sprawled out connected to a handful of unfinished projects or tasks I started. This is it! This is what is causing perhaps 60% of the mental mess and anxiety. I take mental note, or write down all of the open projects I have and state my intentions to finish them. All it takes sometimes to sync into a flow with whatever you are trying to accomplish is a shift in the mental direction you are facing. The direction you may be standing in now is APAP, or as perfect as possible. That's a direction I can easily get stuck in and it usually never leads me anywhere. I can compare this to being lost out in space, being in limbo, or a record skipping. Once you become aware of AFAP, or as fast as possible, a shift occurs in the mental direction you face. The circular platform you're standing on begins to turn and you now have a different view. Along with this view comes a different set of values about your project. What happens is that speed becomes the most valuable aspect over perfection when strategizing how to finish more of your work. (Side Note: The more widely used 'as soon as possible' phrase wouldn't measure speed in this case, it measures time. Therefore, it doesn't carry the same power in this context.) Speed is important because the circular platform you are standing on isn't spinning on a fixed axis, it's moving too! Moving forward in time. If you wait too long, you may miss the prime psychological opportunity to harvest that idea. Our minds can often work against us. One must move quickly and quietly as not to set off mental traps and triggers. A.F.A.P. (quickly). No self judgement (quietly). As a result, I often write A.F.A.P. on each of my wrists with a pen (or somewhere else in sight, probably a little less toxic). It is such a powerful concept that it propels me forward by any means necessary to the end of my project. Just get it done. I'll be in the process of creating and then as quick as lightning striking, I'll become overly aware of the details of my creation's existence. I begin to wonder if my creation is worthy enough to meet the standards of the world around me. I've noticed many people here on Earth use a system of ranking and comparison in order to legitimize the quality of something. Perhaps this is because there are so many individuals in existence, each holding similar powers of creation, that scrutiny must take place in order to thin down the crowds. Room has to be made to stand out and that space could be created through systems of ranking and comparison. Having to face potential criticism can frighten anyone out of releasing anything out into the world. I experience this very intensely. My turning point came into focus when the uneasy feeling of unfinished or unreleased projects began to grow and take over my peace. It is more painful, in my own opinion, to prevent the birth of your creation, than to release your work and face possible scrutiny. The good thing about this situation is that you really only have two solid options. Jump or Remain. I choose to jump more and more often. I share whatever I'm going to share and I don't look back. Move on to the next project immediately or get beneficial rest. The last thing I ever want to do after I send something I've created out into the world is lay back up with it all day. Prior to it's release, I spend countless hours examining it for errors or blunders. Those are my final hours with it. Of course in the future, I may take a casual stroll through the park of my creations, sit on a bench and honor it's existence. I honor the time I spent laboring over my beloved creation. But for the most part, I keep my eyes forward and jump right back in to the next task or project. One of the greatest things I've learned over the last couple years is (excluding some rare cases) it's not about what you put out, it's about how frequently you do it over a certain period of time. To sum up my current ideas on the subject, get into a rhythm, a flow, a rate of movement, and maintain that rate as steady as possible for as long as possible. Lower the frequency if necessary until you can master that level and then take on more. If you can't create or release one song a day, do it once a week. If you can't write 1,500 words a day, write 500 a day instead. If you can't do one blog post a week, do two a month. If you can't film and edit one Youtube video per week, do one per month. The more you do something, the faster and more skilled you will become because you will begin to avoid more and more pitfalls. Over time, you find quicker routes to the same destination. Find the flow that fits you and stick to it. It will pay off if you keep shooting out those smoke signals into the air at a consistent rate. The message will stretch high into the skies and more people will begin to see. Aldous Huxley once said "Consistency is contrary to nature, contrary to life. The only completely consistent people are the dead." With that being said, I can see why people who pull off longs stretches of mostly consistent behavior seem to be praised and rewarded so greatly. Those people, are pulling off trick or stunt moves, surfing waves with ease and grace. The people are amazed by their show. The surfers have been doing this a long time because they love the water. In conclusion, I've learned you must be on repeat when it comes to whatever series of actions it takes to reach your goals and eventually you will sync into the rhythm or wavelength of success. I may be able to do it all, but is that my most strategic and swift move to do so? Here is another opportunity to examine your work flow. There may be areas in your production process that slow down or even halt your productivity. Think of yourself as a manager of a factory. You come down from your office and take a walk around the grounds. There are seven stations lined up in a row, each with a version of you operating various machines (machines, in this metaphor, can equate to a series of programmed actions necessary to complete a particular task). Each station produces a crucial element to the final product that is released at the end of the line. You walk past each station checking productivity. Right around station three you notice a version of yourself working even faster than the others. This is your strongest point, very well done. Landschaftspark Duisburg-Nord. A factory that is now a neon-lit park that honors the factories good work. You continue on down the line and everything is running smoothly except for station number six. You walk over to it and see a version of yourself fumbling around with the task at hand. As a result, production has been slowed and output reduced (bottleneck). There are many different decisions that could be made at this point. You could eliminate the station altogether, depending on how crucial it is to the end result. You could train to do the job better. This would take time, and if we are trying to quickly finish and release projects, we might not have the time for various learning curves. A good choice, if possible, is to delegate. Allow someone else, which whom the task comes easier, to complete this part of the process for you. Delegation is a great option when figuring out how to release more of your work. Reach out and replace yourself with someone else to do a particular aspect of the job. 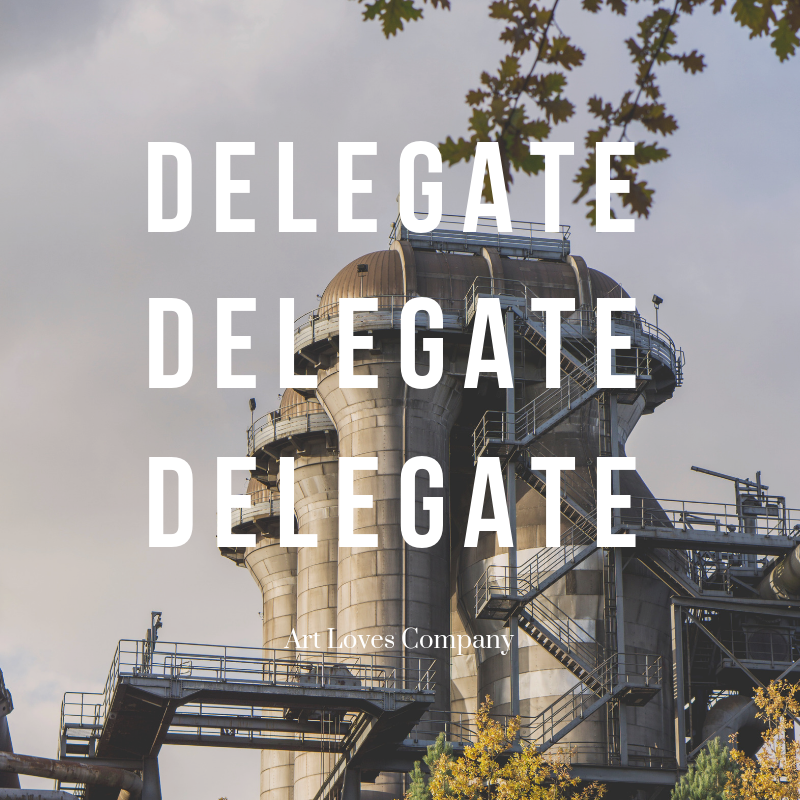 Some of the most successful people and companies have mastered the art of delegation. I actually struggle with this sometimes either due to wanting the glory of saying I did it all by myself, or because of project budget limitations. There are inexpensive ways to get help with various tasks involved with your project. If you are lucky, you have people in your circles that have strengths where your weaknesses exist, and vice versa. Get help and get it done as fast as possible, A.F.A.P..
sUBSCRIBE TO ME, PLEASE. I THINK YOU SHOULD.